directory of oxnard, california (ca) airport information, local aviation related businesses, products and services useful to aviators. charter and agricultural spraying services based in oxnard, california. offers hull inspections and moored vessel bottom cleaning. features company and service profiles. oxnard, california. offers subsea services in oxnard, california, usa. features company and management profiles, service overview, and private login for clientele. airport information, local aviation related businesses, products and services useful to aviators. oxnard, california, united states. light duty towing service and auto parts supply. oxnard, california, united states. light and medium duty towing service. crewcab trucks availability as well as online auto auction list updated every 60 days. 8 pacific western inc north america. north america. truckload broker in oxnard, california. servicing pacific ports and the southwest including port of houston. heavy haul specialty, flatbeds, vans, refers, tri and quad axle flats. Oxnard, California flight school offering single and multiengine flight training, aircraft rental, pilot time building and recurrent training such as instrument proficiency checks. Full service dive shop located in Oxnard. Karting racing school. Learn to race all types of go-karts. Located in Oxnard. Located in Oxnard California. Provides half day, full day, two or three day classes and lapping sessions. Graduates qualify to compete in the Arrive and Drive Race Series. Corporate and team building programs. Chief instructor is Jim Hall. Berthed in Oxnard, the Sunfish provides charters to the Channel Islands. The site includes pictures of the boat and a schedule of dive trips. lawyer, based in oxnard, offering general civil and criminal defense services, including representation for personal injury cases. based in oxnard, california. its main purpose is to help hard working immigrants and their families obtain justice and fair treatment. The Oxnard, California Council is the third oldest council in the state. The council boasts over 400 members and serves 5 parish churches and 2 military chapels. a band from oxnard, california, playing old and new school punk. with mp3 downloads, a biography, pictures and news. bluesband from oxnard, california. features mp3s and upcoming performances. Local television station providing news and information for the Tri-Counties, including Oxnard. greenroom is a melodic punk/emo band from oxnard, california. site features polls, pictures and news about the band. steve white and the barstool pigeons are an oxnard blues band featuring the soulful vocals of steve white and the burning lead guitar of mike fishell. SiteBook Oxnard City Portrait of Oxnard in California. 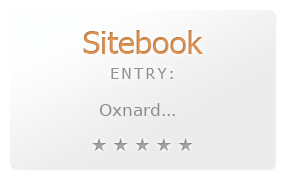 This Topic site Oxnard got a rating of 4 SiteBook.org Points according to the views of this profile site.